^ Lopez, Napier (13 August 2016). ^ "Google Is Building A New Operating System From Scratch: 'Fuschia'". 2016-08-15. ^ Etherington, Darrell. Google’s mysterious new Fuchsia operating system could run on almost anything. TechCrunch. AOL. August 15, 2016 [October 5, 2016]. ^ Fingas, Jon. Google's Fuchsia operating system runs on virtually anything. Engadget. AOL. August 13, 2016 [October 5, 2016]. ^ Fingas, Jon. Google's mysterious Fuchsia OS looks like an Android re-do. Engadget. AOL. May 8, 2017 [May 9, 2017]. ^ Gartenberg, Chaim. Google’s mysterious new Fuchsia OS has a UI now. The Verge. Vox Media. May 8, 2017 [May 9, 2017]. ^ Davenport, Corbin. 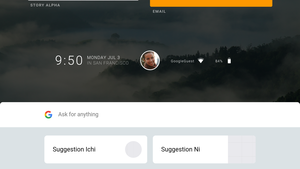 Google's "Fuchsia" operating system is taking shape with a new design. Android Police. May 8, 2017 [May 9, 2017]. ^ Add Fuchsia OS support. GitHub PR for Swift. 2017-11-15. ^ Preparing to install Fuchsia on Pixelbook[永久失效連結].GitHub.[2018-01-03]. ^ Putting Fuchsia on a Device[永久失效連結].GitHub.[2018-01-03]. ^ 谷歌 Fuchsia 源码现身 AOSP，支持 ART 运行环境 - 开源中国社区. www.oschina.net （中文（中国大陆）‎）. ^ Amadeo, Ron. Google’s “Fuchsia” smartphone OS dumps Linux, has a wild new UI. Ars Technica. Condé Nast. 2017-05-08 [2018-04-04]. ^ Amadeo, Ron. Google’s Fuchsia OS on the Pixelbook: It works! It actually works!. Ars Technica. Condé Nast. 2018-01-08 [2018-04-04]. Right now, Google's built-from-scratch kernel and operating system will actually boot on the Pixelbook, and some things even work. The touchscreen, trackpad, and keyboard work and so do the USB ports. You can even plug in a mouse and get a second mouse cursor.